SCP-2030: LAUGH IS FUN by PeppersGhost. SCP-2030 manifesting on a popular on-demand video streaming site. Still frame from hidden camera footage of SCP-2030-1 revealing itself. Special Containment Procedures: Foundation-operated web analysis bot Delta-09 ("LAUGHSTOP") is to be kept in constant operation and checked for defects twice a week by a Level-2 staff member familiar with its operation. When functional, the bot will search a wide range of file sharing and video streaming websites for SCP-2030 and remove any manifestations discovered. Finding and isolating SCP-2030's point of origin is considered a Delta-Level priority. Efforts to locate the studio where SCP-2030 is filmed are ongoing. Description: SCP-2030 is an anomalous phenomenon that manifests as a television series. The medium through which SCP-2030 manifests changes depending on the most popular format currently in use; as of 2014, SCP-2030 most commonly inserts itself into automated DVD rental kiosks, file sharing websites, and paid on-demand video streaming services. Prior to 2012, SCP-2030 commonly manifested as a DVD set in video rental stores, and as VHS tapes prior to 2003. Thus far, no reliable evidence that SCP-2030 manifestations took place prior to the year 1993 has been discovered; however, thirty-eight (38) seasons of programming are known to exist, implying that SCP-2030 has been active to some degree since 1976. The series' title typically appears as Laugh is Fun, although variations on this name, such as Laugh is Life or Laugh is Laugh, are not uncommon. The series has no corresponding "box art"; it mimics art from other television series, often causing viewers to select it mistaking it for another program. The show is a hidden camera comedy series, showcasing the candid responses of various people to bizarre, disturbing, and often anomalous situations. Episodes usually run between 10 and 12 minutes, and feature introductory and closing segments that bookend the hidden camera footage. No episode to date has had an end credit roll. SCP-2030-1 is a (presumably) human adult male that serves as the show's host, providing introductory and closing commentary as well as appearing to "victims" to reveal that they are being filmed for a television series. SCP-2030-1 is invariably shown wearing a royal blue three-piece suit with black and white wing tipped shoes. Due to the way in which scenes are filmed, SCP-2030-1 is only seen from the neck down, making identification difficult. It refers to itself as "Laughy McLaugherson". Individuals appearing on the show often react to the events that they witness with panic or distress, but appear immediately calmed upon the appearance of SCP-2030-1. This is true even when the individual in question has sustained significant bodily harm or witnessed a particularly traumatic event. Additionally, most recorded individuals seem to express some degree of familiarity with SCP-2030-1, with some claiming to be fans of the show. Research into whether SCP-2030 uses its viewership as its victim selection pool is ongoing. Episodes follow a particular theme that each prank segment alludes to. SCP-2030-1 introduces these themes at the beginning of each episode in an as-of-yet unidentified film studio whilst standing atop a bright yellow stage decorated with oversized geometric shapes of various colors. Episode themes vary from the mundane, such as 'the beach', 'pets', and 'candy', to the strange and violent, such as 'mail fraud', 'arson', and 'terrorism'. SCP-2030-1 delivers a similar speech at the end of each program to close out the show. At the end of each episode, the camera pulls back and around from SCP-2030-1's stage to show the studio audience, which usually comprises the individuals featured in the episode. During this time, the words 'Filmed in front of a studio audience. Created in partnership with YWTGTHFT' are superimposed over the footage in white text. Research into the identities of the people featured in the show's prank segments has revealed that they are all persons who were officially documented as having died or gone missing in the year they appeared on the program. Thorough investigations into the deaths of SCP-2030 participants have revealed a number of inconsistencies and contradictions in matters concerning the circumstances of the deaths. Additionally, exhumations of the individuals' remains have revealed that all recorded participants' bodies are currently missing. The general consensus among researchers assigned to SCP-2030 is that victims are likely abducted after their use in the show, with their disappearances covered up when possible. However, no concrete evidence connecting the individuals' deaths with SCP-2030 besides the show's footage has yet been found. Addendum: The following are examples of pranks featured on the program. Individuals involved: Macey Gersham and Kyle Parker – killed by a hit-and-run driver on 09/18/00. Scene description: An elderly woman sits on a park bench, feeding nearby pigeons with seed from a bag. Gersham and Parker, a couple, walk down a park path and approach the woman. Once the two come within approximately 1.5 meters of the elderly woman, a swarm of pigeons fly into the elderly woman's mouth, causing her stomach to become severely engorged and quickly rupture. The couple express great distress at the event until SCP-2030-1 emerges from the elderly woman's open stomach cavity, at which point Gersham and Parker appear relieved. Individuals involved: Doris Carter – died of ovarian cancer 02/24/97. Scene description: Mrs. Carter walks into her kitchen and opens a cabinet door, out of which falls a large mass of flesh. As Carter screams, the mass grows and shapes itself into a severely disproportional facsimile of former Prime Minister of the United Kingdom Margaret Thatcher, with its head twice as large as its torso. Carter rushes to leave the room, but the Thatcher creature leaps onto her before she can escape. It extends its tongue into the woman's open mouth, and Thatcher faces of various sizes begin appearing across Carter's skin. The faces proceed to recite Thatcher's April 1986 speech on the bombing of Libya in perfect unison. SCP-2030-1 climbs out of a nearby cupboard and points to the hidden cameras; Mrs. Carter smiles, the creature's tongue still extended down her throat. Individuals involved: Melissa and Travis Englund – disappeared, last seen 05/12/89. Scene description: Mrs. Englund lies in bed next to a male figure, presumably Mr. Englund. A series of high-pitched squeaking noises are heard, and Mrs. Englund is awakened. She tells her husband to wake up, but he does not respond. She places her hand on his shoulder, but quickly draws it back with a shriek. His skin begins to undulate, as though something is moving underneath. A multitude of squirrels then burst from various places on his body, quickly filling the bed and crawling onto the woman. She rises to leave the room, but SCP-2030-1 walks in and turns on the light. He is accompanied by Mr. Englund, who has been skinned from head to foot but gives no indication of feeling any discomfort. All three share a laugh and the segment ends. Individuals involved: Gary Turman, Lindsay Turman, and their children – died in a vehicular accident on 04/28/89. Scene description: The four sit around a dinner table eating a meal. Mr. Turman begins coughing and gasping for air, as if choking. As the others at the table begin to panic, a pair of slits appear on Turman's throat, allowing him to breathe. These slits quickly become nostrils, which rapidly grow into a full nose, which in turn becomes an entire second head, identical to Turman's original. This second head then sprouts a neck of its own, and the entire process repeats. This continues until eighteen necks and heads have sprouted from the original, at which point SCP-2030-1 steps out from underneath the table. Everyone present erupts into raucous laughter, including all nineteen of Mr. Turman's heads. Individuals involved: Rebecca Nash (surgeons unidentified) – died of complications in child delivery on 11/02/13; hospital records show no evidence of anomalous activity during birth. Scene description: A team of obstetricians perform a caesarian section procedure on Ms. Nash, who is in labor. The team comment on the size of the child's cranium and the amount of hair present on it. Several minutes into the procedure, a doctor makes an exclamation of surprise and drops an instrument on the floor. Muffled vocalizations can be heard in the background. The rest of the staff begin to panic as the head emerges unassisted from Nash, causing her a great deal of pain. The child's head can be seen to resemble that of American television presenter Ryan Seacrest. The child sings Row, Row, Row Your Boat in a female voice as it continues to exit the mother. As more of its form emerges, the child can be seen to have the body of a fully grown octopus (Octopus vulgaris). Once the child fully exits Nash's body, it continues to sing as another head begins to emerge. Three more children are produced in total, with the heads of celebrities Jack Nicholson (American film actor), Johnny Cash (American singer-songwriter), and Martin Freeman (British film actor), respectively, all with similar octopus bodies. Together, the four sing Row Row Row Your Boat in four part harmony. SCP-2030-1 walks into the room and the show's jingle plays. SCP-2030-1 points to the hidden cameras in the room, prompting the obstetricians and Nash to begin laughing. The creatures on Nash's torso continue to sing. Nash then loses consciousness, presumably from blood loss. Transcription: Ha! What a ride, eh, folks? We've seen printers that eat, eaters that print, and everything in between! Makes you appreciate the old clunker you have back the office, doesn't it? No, printers may not always work when you want or need them to, but they sure make for some excellent comedy. And that's what we're about here: comedy. We're here to make you laugh. We hope you laughed. Thank you for laughing with us. That's what we're about here, doesn't it, folks? Come laugh with us again next time! 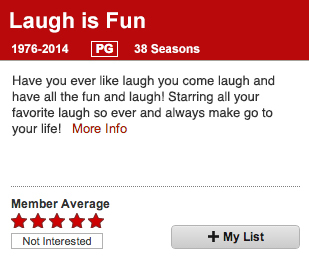 And remember: LAUGH … IS … FUN! Good night! And laugh! And laugh! Just laugh! We love the make laugh. Make more for laughter so as to for laugh. Laugh with us. Laugh with us. (Studio audience joins in unison) Laugh with us! Laugh with us! Laugh with us! Laugh with us! Laugh! Laugh! Laugh and let us in! Note: Video cuts off abruptly and a black screen is displayed for thirty seconds. Laughter and soft, wet noises can be heard in the background before the program ends.